Too often mainstream audiences are dismissive of Japanese animation, or anime as it is more widely known. They think it's all about big robots with transformation skills and wide-eyed young girls and frown-faced young boys with superhero leanings, a subject for parody and not to be taken seriously. And sure enough, you'll find plenty of that. But show me a live action drama in the past couple of years with the semi-abstract narrative complexity of Ghost in the Shell 2: Innocence, the sense of apocalyptic vision of Akira, or the sheer unbridled imagination of Spirited Away. And it's a myth that anime is targeted primarily at kids – in Japan, the mainstream anime audience (and in Japan anime feature films play in cinemas alongside the latest Hollywood blockbusters) covers a wide age and even social range. The very first time I laid eyes on a working Sony PSP was on a Japanese commuter train, which a middle-aged, suit-dressed salaryman was using to watch anime on his journey to work. Several series and films are targeted very specifically at an adult audience, their darker tone, graphic visuals and sociopolitical themes either inappropriate for younger viewers or unlikely to be fully appreciated by them. I freely admit that I have seen only a fraction of the anime series and features that are out there, certainly a lot less than my esteemed fellow reviewer CNash, whose specialist area this is and whose knowledge of the genre greatly outweighs mine. Which is why the anime discs tend to be directed to his doormat. That I got to cover Paranoia Agent was, for me, a rather splendid accident of chance. The box set arrived at the same time as a similarly sized set for Serial Experiments Lain. Both looked interesting, but we each have busy lives outside of these review pages, so agreed to split the task, and I got Paranoia Agent. Had that not happened, I might never have ended up as glued as I was to one of the most intelligent, involving and thrillingly realised series I have seen in years. Some plot to get you started. It's modern day Japan, and young designer Tsukiko Sagi is under considerable pressure. Creator of the astonishingly successful Maromi figure (think Hello Kitty and then some), she is on a time limit to come up with an equally popular successor, an impossible task that her employers all gleefully believe she can complete. But the ideas just aren't coming and Tsukiko is starting to crumble. Then one night on her way home she is attacked by a young and mysterious assailant, one dressed in a baseball cap, riding on roller blades and wielding a crooked golden baseball bat. The assault leaves her hospitalised, but the effect is has on her is not as negative as we, and indeed the police, would normally expect it to be. As the case is investigated by gruff, middle-aged detective Ikari and his younger colleague Maniwa, stories of further attacks by the figure known as "The Lil' Slugger" (also referred to as "Shonen Bat") begin to emerge. Could there be a connection between the victims? Why do they end up seeing the assaults in a positive light? And just who is the mysterious Lil' Slugger? Before I go on I offer a warning. In order to discuss just why I believe Paranoia Agent to be one of the best things to sit in my DVD player all year, I need to reveal a little more plot. Now most of the above is from episode 1, and a lot of what makes the series so compelling is not knowing just where the hell it will go next, or indeed quite where you are at any one time. Speculation and the process of working it all out are two of its principal pleasures. I promise to keep the spoilers to a minimum, but if you want to go in completely cold – and that's not a bad idea – then hop forward to the last paragraph or go get your hands on disc 1. That's all you'll need to get you started. 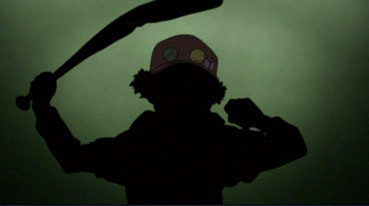 Although compelling as a straight drama, Paranoia Agent really shines in its allegorical subtext, which runs throughout the series, feeding the narrative like oxygenated veins (check out the first couple of minutes of episode 1 and you'll get a taste of things to come). Do not be misled by the above plot outline – this is not about street crime or wayward youth, but the pressures that dominate modern Japanese life and by association that of any modern commerce and competition-driven society. It quickly emerges that all of those attacked are under some sort of pressure from those around them, whether it be workmates, family or their friends and peers. In each case they are in some small way set free by the attack. Lil' Slugger is feared by society, but for his victims he represents a form of escape. From what? Well, it depends on which episode you are watching. Although the narrative itself follows a linear path through the series, the viewpoint shifts from episode to episode, the first four each focussing on a new potential victim who is suffering from differing social or personal pressures. In keeping with the subjectivity switch, the design and animation varies from story to story in inventive but highly appropriate fashion. This is strikingly evident as early as episode 2, The Golden Shoes, in which the schoolmates of popular kid Yuichi increasingly suspect that he is the mysterious assailant, an assumption based solely on his preference for rollerblades as a mode of transport. 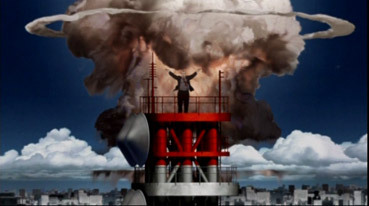 Initially the episode adopts the overriding minimalist realism of the series (objects are geometrically correct and easily recognisable without the need for excessive detail), then intermittently gives way to more distorted visuals in order to represent the world from Yuichi's emotional viewpoint. As a result, the episode, like Homer Simpson's Guatemalan Insanity Pepper trip, can be admired as much for the design and animation as the storytelling. And yet there's so much more to it than that. Issues of friendship, schoolyard popularity, the consequences of hastily passing judgement and a whole lot more are explored, and for just about anyone who did not find school days a breeze, much of what occurs here will be instantly recognisable. It also tells a solid story in fascinating and intelligent fashion, with the narrative never overwhelmed by the subtext. A similar stylistic approach is taken when the two detectives finally get to interview a suspect for the attacks, a boy trapped in a world of fantasy games and comics who imagines himself as a warrior superhero and his bat as a golden sword of justice. As he relates events from his distorted viewpoint, the episode takes on the look and sound of a superhero-orientated anime, into which the detectives step to continue their investigation and interrogation as characters within the boy's fantasy. 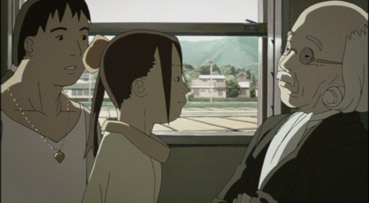 In two later episodes, the design and animation become charmingly simplistic in the style of post-war Japanese cartoons, as the middle-aged character whose viewpoint we now share becomes lost in memories of his childhood years and refuses to face what is happening to him in the here and now. As we move from story to story, the two detectives and Lil' Slugger remain the only constants, at least at first. In early episodes there are intriguing hints of narratives to come, and it is only when a new story unfolds that you realise that you have already glimpsed part of it in a previous episode. Only in the final three chapters do all of the elements and characters come together into more linear storytelling. I have to admit this was my least favourite part of the series – don't get me wrong, this is still terrific and imaginative stuff, but it does tend to literalise things that until then had been tantalisingly suggestive, which is just the way I like my subtextual meat cooked. The show hits a kind of peak of daring and imagination on disc 3, with three very different episodes that are all extraordinary for differing reasons. Working backwards, Episode 10, Mellow Maromi, centres around heavily put-upon and luckless production manager Saruta, who works at the animation studio that is preparing to produce an animated series based around the Maromi character and who seems to annoy just about everyone there. As his co-workers are systematically picked off by Lil' Slugger, the narrative is intermittently put on hold to allow Maromi to pop up and explain to the viewer just what the jobs of the various victims entail, in essence deconstructing the process of creating the show in which the story is set. Episode 9, Etc, is a gorgeously devised and structured piece in which four gossiping women attempt to one-up each other with their own stories of Lil' Slugger and his victims. When they run short on anecdotes they take to inventing them, a tactic revealed when one tells a story whose literary fame would be instantly recognisable to a Japanese audience but whose relevance will likely fly over the heads of western viewers. The stories the women tell are as compellingly played out as the one that links them, none more so that the superb visualisation of the terrifying pressure that exams can exert on the young, especially relevant in a society in which the pressure to achieve is often quoted as a key contributory factor to its high youth suicide rate. But it's episode 8, the brilliantly titled Happy Family Planning (see it and see why), that the series visits its darkest places and explores its most adult themes. It revolves around three members of an on-line suicide chat group, who agree to meet up and help each other to kill themselves together. Hulking Zebra and ageing Fuyubachi are both fine with the plan, at least until until they meet the third member of their group, Kamome, who turns out to be a relentlessly cheerful and playful child. Her jovial attitude is reflected in the tone of the episode, which is constantly upbeat, even when things are at their seemingly blackest, which somehow makes the story even more troubling (see The Missing Scene below). In keeping with the layering found in the rest of the series, this is never dark for the sake of dark, but touches on several problematic aspects of Japanese society (the high national suicide rate, the fetish surrounding the Japanese schoolgirl image) and a few that reach beyond national borders (the dangers associated with chat-room anonymity). And if you're looking for an ending that initially confuses but with consideration astonishes in its subtle suggestiveness, then this is the story for you. Stylistically and narratively thrilling moments pop up throughout the series, from the pavement calculations chalked out by the old man who delivers the frankly bemusing 'Prophetic Visions' at the end of each episode, to the sometimes chilling appearances of Lil' Slugger (never creepier than when seen by both detectives in their own station after an in-cell murder). But the real strength of Paranoia Agent, if you put aside for a moment its excellent artwork and animation, is its effect as a collective whole. Watch one episode and you might be intrigued, but watch four in a row and you're hooked and aching for more. 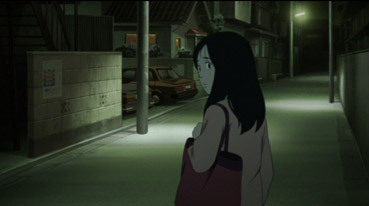 I was left wishing that there were a live action series around today that demonstrated the sort of intelligence, boldness and narrative complexity that Paranoia Agent has in abundance, but at the same time am very aware that the series is able to do what it does so well precisely because of the unique possibilities offered by the medium of animation. If you find yourself pre-judging a series because of that anime label, then it really is time to put that prejudice aside – you might never otherwise find out what you've been missing. Director Satoshi Kon was previously responsible for the acclaimed anime features Perfect Blue (1998), Millennium Actress (2001) and Tokyo Godfathers (2003), and far from watering down his style for television, he has clearly thrived in the episodic nature and longer overall running time offered by medium, and has created his most complete and thrilling work to date, and one that fully deserves to stand on a tall pedestal in the anime hall of fame. I just have to give a special mention to the opening and closing title sequences, just about the best I have seen in I can't remember how long. I am fully aware that I am not the first to celebrate these remrkable bookends and that there have been a number of on-line discussions, especially in Japan, about their style and meaning. I admit to being a tad baffled by my first encounter with both and even skipped past the opening credits on episodes 2 and 3, so keen was I to get to the stories themselves, but by episode 5 I was in love with this sequence. Set to an impossibly exuberant song whose cut-up style lyrics speak of not worrying about the tsunami and "a magnificent mushroom cloud in the sky," it features many of the main characters individually laughing straight to camera, standing amidst fast-moving traffic, on the moon as nuclear war rages on earth in the background, in landscapes of devastation, or atop a tower in front of a atomic explosion. What at first looks almost randomly surreal feels after a few viewings like a portrait of a society in complete meltdown and a populace on the brink of uncontrolled hysteria. That it ends on the laughing figure of Lil' Slugger sends shivers up my arms and spine every time. Oh it's just superb. I've been singing the song ever since, a task made possible by the odd but welcome decision to alternately subtitle the lyrics with the English translation and a Romaji version of the original Japanese. The end credits offer similarly intriguing reading. Far more gentle in tone, they feature the same characters all lying asleep, or perhaps dead, on a grassy meadow. There's certainly been plenty of debate over this within the realms of Japanese fandom and bookended as it is with the apocalyptic opening credits, the sequence paints a dark picture of where the series may or may not be heading. That we pull out at the end to see that the characters are lying in the shape of a question mark with a giant Maromi figure in its centre only adds to the intrigue. 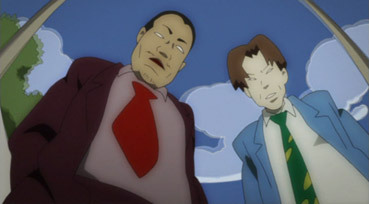 I can't be the only one who, after all this speculation, howled with dismay when Satoshi Kon reveals on the commentary that the primary purpose of the exhuberant opening credits was simply to wake people up (the show was originally broadcast after midnight in Japan) and then at the end signal that it was time to go to sleep. I challenge anyone watching them to believe that's all there is to it – there's even a thread on the IMDB about the title sequence alone. Either way, it's great stuff. "To obtain this category cuts of 1m 20s were required. The cuts were Compulsory. Cuts required (on potential harm grounds) to the sight of a child attempting to hang herself, and accompanying subtitles. Cuts in accordance with the Video Recordings Act 1984." Interestingly, just one week after I read this, an episode of Casualty on BBC1 contained a shot of a young girl hanging from a tree, a live action sequence presented as serious drama rather than the (very) darkly comic scene that was removed from this animated series. For the record, the missing sequence involves all three characters and their attempt to hang themselves from a tree branch, but Zebra makes a cut to Kamome's rope so that it will snap at the appropriate moment. When Zebra slips off the stones he is standing on and begins to struggle with his rope, Kamome sees this as another fun game and begins pulling up and down on her own noose as her two companions start to suffocate. Finally the branch breaks under the weight of all this and Zebra and Fuyubachi tumble down the hill with Kamome in chase. If you want to catch a glimpse of this sequence, watch the 'Prophetic Vision' at the end of episode 7 – there's a shot from it that the BBFC appear to have missed. Anamorphic 16:9, the picture is clean, with good contrast and colour reproduction, and there's not a lot more you can ask of an anime transfer. There are signs of an NTSC to PAL conversion, but it's a good one – there is little evidence of unintentional blurring on movement. Stereo 2.0 only, in Japanese or (American) English, the mix is impressive throughout, with a very good dynamic range and excellent clarity. Sound is really used effectively in places – the opening couple of minutes of episode 1 are very nicely layered, though this is better handled on the Japanese track that the English one. In other respects the English dub is not a bad job, though the Japanese voice acting definitely has the edge. The Saroshi Kon Interview (5:22) is a segment from a Japanese TV programme (hence the scrolling Japanese text that plasters the screen throughout). Despite its short running time, there's plenty of interest here, not least Kon's interest in reversing the notions of cause and effect. Storyboard (21:02) provides the storyboards for the entire first episode, either full screen or alongside the finished artwork. There are Trailers for other MVM releases Samurai Champaloo (1:38) and R.O.D. the TV (1:32). The Opening (Creditless and Japanese) (3:00) and Ending (Creditless and Japanese) (2:59) sequences are a standard anime DVD extra. Japanese Cover Art consists of 12 covers (6 retail, six rental) from the Japanese DVDs. Character Art is 40 pages of character drawings, including line art, usually from several angles per sheet. As with the cover art, these are not full screen. This is the big one. 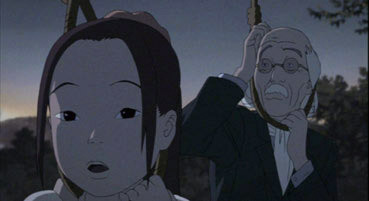 Here there is an Audio Commentary on all three episodes by director Satoshi Kon, writer and production chief Seishi Minakami and producer Satoki Toyoda. Subtitled in English, the name of person speaking is titled at the top of the screen, an excellent feature that I've only seen before on the Spanner Films' DVD releases Drowned Out and McLibel. The discussion is rarely screen-specific, but does cover the opening and closing credits, the production, character and dialogue, and sound design in some detail. Episode 2 is highlighted as being fraught with difficulties, and Kon himself seems surprised it has been so celebrated. The Trailers here are a seductive one for Gunslinger Girl (2:10) and a less so one for Ikki Tosen (1:26). Paranoia Agent has already built up a devoted fan base and it's easy to see why – it's quite simply one of the finest series, anime or otherwise, to land on UK shores in a long, long while. If you are already open to the unique pleasures of Japanese animation then waste no time in hunting it out – if you have until now been resistant, then I urge you to put aside your reservations and let Lil' Slugger swoop by and knock you for six. Very highly recommended.